Okay. I’ll be honest. We, men, are lazy. These complaints often come from our spouses. And they’re right. But we’re just stupid men. We can’t multitask (nobody can by the way). And from the moment we feel we have to do everything instantly to satisfy the other, we lose the overview. Next step is a state of total mind block, causing an acute urge for couch surfing. Don’t worry. This is typical human behavior. Although that doesn’t mean we shouldn’t do something about it. The solution is as simple as it is efficient. Start using your refrigerator as a scrum board. Grab some post-its, and make 3 columns: to do, ongoing, done. Ask your partner to make a post-it for every household task he or she wants you to do. 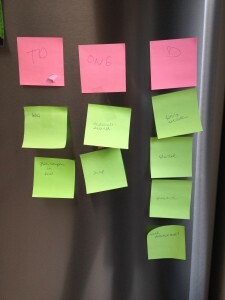 Let them stick the sticky notes on the refrigerator in the “to do” column. Ask them to order the tasks by priority. Agree on the rules, for example that you’ll only do one or two tasks at a time, and that the priority can change as long as you haven’t moved a task to the “ongoing” column. How will this improve the quality of your relationship? Inspection. You can stop trying to remember everything. You can get it out of your head. But you’ll be confronted with it every time you grab a beer. Transparency. There is open communication. Your partner knows exactly what you’ve done, what you’re doing (or should be doing), and what is next. Adaptation. You don’t have to guess what to do first. Your partner can re-prioritize as long as you haven’t started the task. Expectations are managed and goals are aligned. The refrigerator visualizes you’re no hero. You have the right to think this is uttermost nonsense, but if you recognize the patterns, maybe you can give it a try. And do not forget to peel off your sticky notes correctly! Henrik Kniberg made this slide deck about agile at home. I especially love the BBQ Scrum example. – work on your relationship, if household works because you do the stuff you’ re ordered to, you won’t last long. You’re equals, so decide together who does what. And what you decide yourself, you remember better. As I said, you have the right to thinks this is uttermost nonsense. Nevertheless, I would like to address your remarks. This post is not about my alcohol consumption. It’s an tongue in cheek story on how agile principles can be applied to a day to day situation. Personally I’m more addicted to Coke Zero than beer. I’m not that fat I presume. I run between 80 and 100 kilometres every month. These techniques help to avoid procrastination. GTD (http://www.davidco.com/) emphasizes that the key to being productive lies in the fact that you free your mind from trying to remember everything, so you can focus on single tasks. Task lists (in time management) or scrum boards (in project management) can help you being productive. Scrum in particular gives you tools to decide together who does what in any kind of equal relationship (either at home or within a development team). When a task is in your head (or your mailbox) it’s your responsibility. When it’s on the wall it becomes a shared responsibility.